Alongside the beautiful river Wharfe near Ilkley the Ben Rhydding Gravel Pits Nature Reserve has a variety of habitats and is a great place to observe birds, plants, butterflies and dragonflies and if you’re really lucky you may even spot an otter! 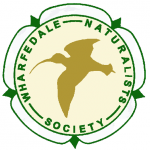 The reserve is owned by Bradford Council and has been managed by a small group of volunteers from the Wharfedale Naturalists Society since 2007. This has involved the control of invasive weeds, woodland management, footpath maintenance, litter picking, scrub clearance, wildlife surveys and a range of other activities to try and improve the site and maximise biodiversity. With the support of Natural England, we were declared a Local Nature Reserve in October 2013 . We were all then thrilled when, on Tuesday 6th May 2014, the Lord Mayor of Bradford joined us to celebrate our success with our official opening. Tim Howson created this great website for us in the same year. Over the following years we have largely go the himalayan balsam under control, our main focus is on controlling the bramble, removing hawthorn and re-establishing species that have been lost or are appropriate to the site. We hold regular work groups, usually the 2nd Saturday of the month from 9.30 until about 12.30. We are always grateful for new volunteers – no experience is necessary and everyone works at their own pace and tools are provided why not give us a try? We hope you enjoy this website and feel free to contribute to it. Steve Parkes, Wharfedale Naturalists Society. If you wish to contribute to this site, and visit the Ben Rhydding reserve, you can ‘Register’ to become a ‘Subscriber’. This enables you to create new posts in the ‘News’ section, upload images and create new photo galleries. Any additional content would be gratefully received because we are aiming to make this site as dynamic as possible. Also, if you have any suggestions on how we could improve it or if you need any assistance on registering or uploading your own content please contact us using the contact form below. All content is approved by the site editor before it is published and becomes live. To register please click on the ‘Register’ menu item in the top right of the page. You will be prompted to choose a user name and password and should then be able to login to create new content.